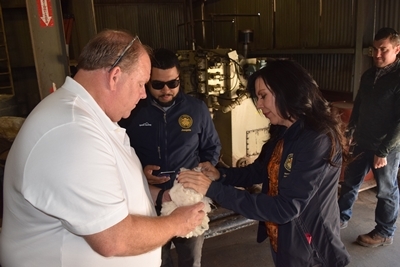 California Assemblywoman Blanca Rubio (D-48) joined the California Cotton Ginners and Growers Association and other members of the Agricultural President’s Council on a day long tour of agriculture in the Central San Joaquin Valley. 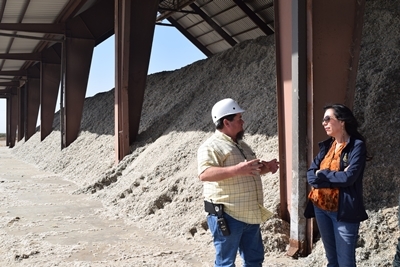 Rubio, who represents areas including Baldwin Park, Covina, Glendora and Azsu, had the opportunity to visit Dos Palos Coop Red Top Gin, The Specialty Crop Company, Fowler Packing as well as Minturn Huller Coop. The Assemblywoman was joined by Association President/CEO Roger Isom, Director of Technical Services Chris McGlothlin and Director of Regulatory Affairs Jodi Raley. The primary issues discussed were water availability, necessary oversight from legislature over regulatory agencies, along with discussing the impacts operations are beginning to feel from the ag overtime and minimum wage bills. The Association looks forward to building our relationship with this Assemblywoman and future opportunities to bring southern California representatives to the Valley! This entry was posted in NEWS & ISSUES on October 10, 2017 by ccgga.